Recently I was asked through Facebook about how someone might start training in Nanquan. Specifically, they asked how to supplement their wushu training with nanquan and what sequence of forms I might recommend for someone who is learning nanquan. Their motivation for asking this question was because they want to have a more well-rounded understanding of various wushu styles. And while their primary style is not nanquan, they feel that it is beneficial to learn the attributes of those styles outside their core focus. Well, this got me thinking a bit. My initial gut reaction was “Actually, I wouldn’t recommend supplementing your wushu with Nanquan.” and the reason I initially felt this way was because I’ve always been an advocate of focusing on a specific specialty with wushu. Having a pretty much non-stop relationship with nanquan for the past 15 years (I only learned other forms such as the compulsories or other styles so that I could adequately help someone with them when I was teaching wushu), I feel that if you really want to excel at wushu you have to bear down and figure out all the special nuances and distinctive attributes of your particular style. I’m reminded of comments people say when they see a nanquan person doing changquan, or vice versa. “You’re doing Southern Long Fist” or “Your Southern Fist is too Northern“. And sure, to really be able to excel at a specific style you have to really focus on it for several years before you can do it well. Especially given the limited amount of time that most of us have to devote to wushu — often just a few hours a week (which I mentioned in a previous blog) — we have to use that previous time to fine tune an understanding of our style for when we go to competitions and put our feet on the carpet. But then I realized that I’m looking at this situation from a specific assumption. Namely, I’m assuming that this person’s focus is on learning wushu to compete as a sport. In fact, not all (in fact, probably a good percentage of people outside of China) practice wushu for competitive sport, but for personal fulfillment. And if that is the case, then one is certainly welcome to complement their training with a wide variety of styles. In fact, it might actually be better for the martial artist who is trying to become a well-rounded practitioner to dabble in several different areas to bring out that broader understanding of each style. I’m reminded of the interview I did with Troy a few months ago, where he talks about how he isn’t really about specifically Chinese martial arts or taolu training, but he is trying to become something “authentic” with martial arts and develop skills that transcend a specific event or competition, but are applicable in multiple facets of an individual’s life. In this context I think that learning nanquan or cross training in different styles makes sense. But besides all this mulling over of the propriety of cross-training wushu styles, it also got me thinking about how I would approach a new student’s introduction to nanquan fundamentals. Of course, I covered this in a broader sense with my blog on a beginning approach to starting wushu training. First, I would spend a lot of time focusing on your stance work. 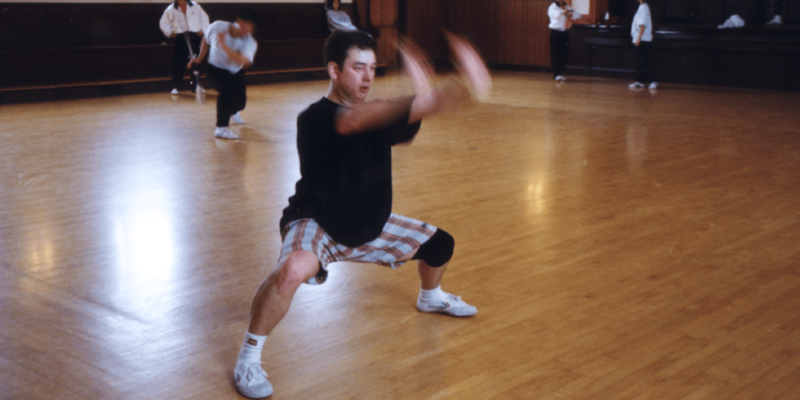 Often times long fisters can get by with some sloppy stances, but in nanquan you are judged heavily on the strength of your footwork. I would probably start the first month with just ma bu and gong bu training. Lots of it. Go to a track every morning and when you are finally able to mabu-gongbu non stop once around the whole track, then you’re ready for phase 2. Remember while doing your mabu-gongbu transitions that the stances are different than those done in changquan. Northern mabu is not the same as southern mabu and the only real way to get the right feeling is to have someone who knows it watch you do it and fix it. But if you don’t have someone like that around you could also do analysis videos online to see if you can understand the difference. Of course, phase 1 also includes some good upper body training. I recommend pushups and pullups focusing on fast repetition rather than slow power. Generating quick punches and pulling techniques is important and I remember Yue Xiao Yu telling me that nanquan athletes in particular need to focus on this sort of strength in the force of their strike — more so than changquan athletes. Yuan Min also echoed this sentiment when I was training with him last year. Oh, and do some fist pushups (make a fist as if you are punching the ground while you do your pushups). It will do a nice job of giving your punches a bit more power. Maybe finger pushups for gripping power too if you can handle them. Now that you’ve got some decent stance strength and good punching power, it is time to actually learn some nanquan techniques. This means a lot of lines of a lot of basics. Li Neng Miao, the power nanquan kid from the 200X Beijing Wushu Team, told me that when he was training nanquan in guangdong they just had them do the same 10 nanquan line basics over and over, every class, for over 5 years. He said that this, more than anything else, was the reason his nanquan had good nanquan feel and technique. You can find a nice video of some nanquan line basics here. These were taken by Matt Wong and Peter Wong (no relation to each other) during a trip to train with the Guangdong Wushu Team back in 2000. This is also one of my top 10 wushu videos of all time and I’ve probably watched this sequence hundreds if not thousands of times myself. I mentioned it in my wushu retrospective series when I talk about “sifu video”. Truth be told, they are doing it a little “half-assedly“, but you get the idea. Even their partial effort looks pretty gnarly. The tricky thing with these line basics is that you really need someone to show you how to do it. You can’t just watch a video of nanquan basics and then start to do them (unless you want to do them incorrectly, of course). Imagine that you had never done wushu before and saw a video of someone doing a line of front stretch kicks. Do you think that you would be qualified or understand the technique enough to do them correctly? You could probably pull off some horrible, ugly version of the movement, but anyone who knew what they were looking at would cringe at the sight of it. The same thing is true for nanquan. If you want to know how to do nanquan line basics correctly, have someone show you who knows how to do them (and not someone who just says they know — someone who actually does nanquan is best). I would probably work on nothing but these for a good 3 months of daily practice. If 4 years was enough for Li Neng Miao, then you’re getting off really easy with only 3 months of nanquan basics. Trust me, you’ll be glad you drilled these when it comes time to doing a form. Speaking of forms, I would first start someone off learning a beginning nanquan form. Actually, scratch that. Probably first I would do my nanquan wubuquan form for a while to get down some good transitional experience. Then I would do a beginning form. After that I would work on beginning forms. And which form would I start with? Probably one of the most boring nanquan forms you will ever learn — but also the most beneficial. The original tiger-crane form is probably the best one for developing good fundamental techniques for nanquan (in my opinion). Ironically, I don’t remember this form at all since I was never properly taught it back in my formative years. Definitely on my to do list! Here is the Nanquan King himself, Yang Shi Wen, performing it. (Actually a mainland variation on the traditional hung gar form, but close enough for our purposes.) Check out those guns. He also has a “beginning nanquan form” online that you can check out, although I’m not as huge a fan of it. Still, it is a good starter form and I suppose I could forgive you if you opted for this one instead of the tiger-crane. Another form I like a lot is the youth compulsory nanquan form, also called the 5th duan nanquan form. Here is the former Nanquan Champ, Ka Li, from the Beijing Wushu Team, demonstrating it (in what looks like the 1998 version of the Shi Cha Hai Sports School wushu guan). Personally, I think this is a better form to start with than the compulsory form, which a lot of people throw at beginners (mainly because they don’t know any other form to teach). But there is a better transitional form to the old nanquan compulsory where they just give you the first two sections and take out the jump inside fall and kip up. As this video says, it looks like the IWuF used this for their youth competitions back in 2006 & 2007. I wouldn’t actually recommend learning this for a beginner, but if someone is telling you to learn the compulsory nanquan form first, then do this one instead. It is the lesser of two evils. Finally, if you like, you can also do this beginning form, which I think is called the 32 form or sometimes just “Beginning Nanquan” by some. I’m not a huge fan since I think it looks a little awkward, but you can try it out if you like. This guy kind of does weird things with his elbows though (at least in my opinion). So there you go. More beginning and low intermediate forms than you probably need to learn. But it should at least give you a good starting point and mastering any one of these forms would put you on a good path to better nanquan understanding. How long would I have you train these forms if I was your coach? Probably at least 6 months. A year to be safe. If you can’t do these forms correctly, then going to the compulsory is a waste of your time. In my experience, someone with amazing technique doing a beginner form will always be better than someone with sloppy technique doing an advanced form. After all, which would you rather see? Liu Qing Hua doing wubuquan or Guy-Doing-Wushu-For-6-Months busting out some ditang quan form? Anyway, those are my first three phases. After that it really depends on what you plan to do with your nanquan. If the goal was to get a good feeling for nanquan, then that should fit the bill. If you want to compete with nanquan, then stop messing around with that Northern stuff and focus your energy. Good luck to everyone with their training regardless. As always, if you have any questions or have some comments, please post them here in the comments area below, of you can reach me on Twitter or through e-mail at hi@markcmoran.com.